January 26th marked the start of the Chinese New Year – The Year of the Ox. 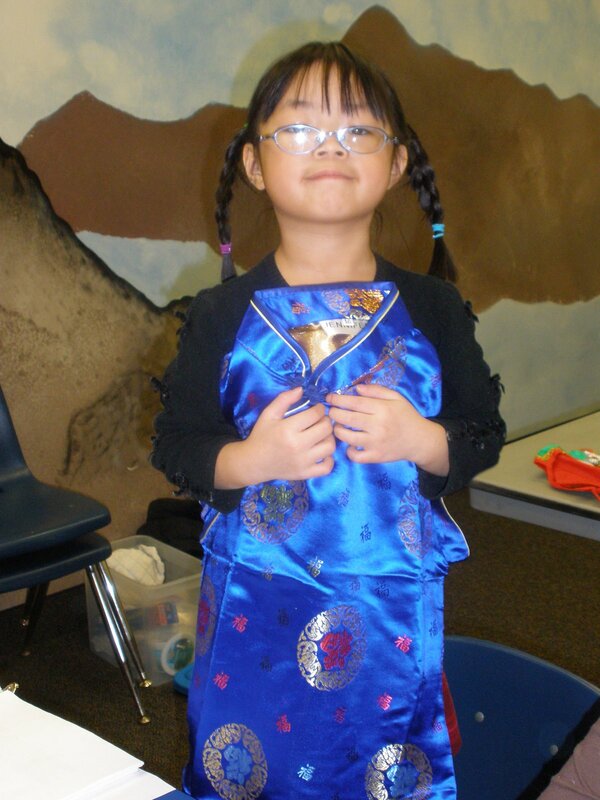 For Home Ec class, I chose to use this special day to focus on China – including food, clothing, and culture. Started the class by giving each girl a “Culinary Passport” – a paper passport that is about 4″ x 8″, has the title on the front with a graphic of an eagle, and about a dozen blank pages. On each page, the girls will write the name of the country they are exploring during the semester, with China being the first entry. Under the country, they put the holiday/special day and today’s date. Brought in postage stamps from China and each girl chose some she wanted to put in her passport. After that, I distributed handouts that tied into the items that were on the display table. 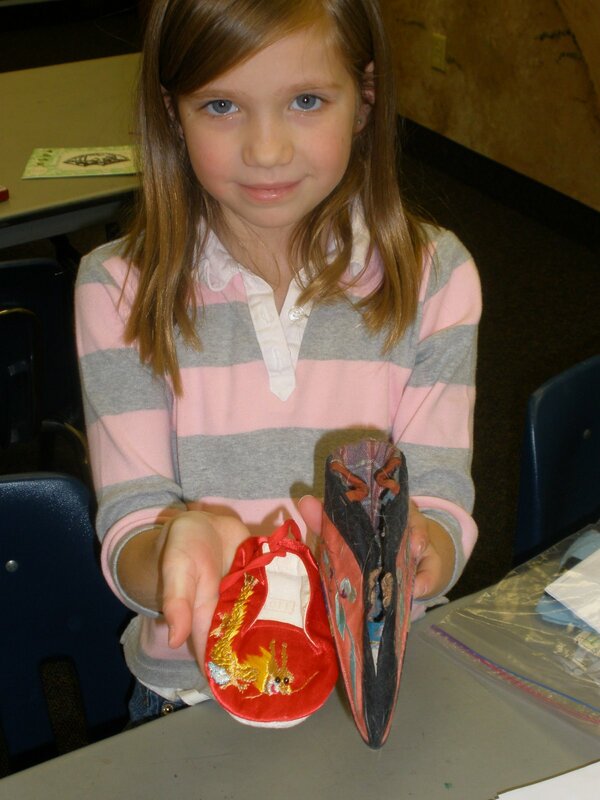 The girls learned about silk worms and how to make silk, and then saw samples of silk (dresses, placemats, hats). In contrast, they saw an adult woman’s shoe – the kind where the feet were bound. Found a children’s website that had x-rays and diagrams of a “normal” foot and a bound foot. They compared the size of a baby shoe to the adult shoe. Quite a difference. Showed them some chopsticks that were purchased in China when Sophia and Olivia were adopted. Gave each girl a handout about how to use chopsticks, and then told them some basic rules about what to do and NOT to do with chopsticks. They thought that part was funny. After looking at more items, it was time for food. 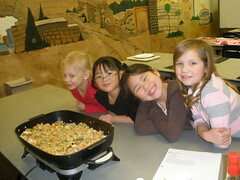 I showed them how to make fried rice. All the girls thought it tasted good. Since I was making the fried rice, I doubled the recipe. Had the girls tell me how many cups, tablespoons, or teaspoons were needed for each ingredient (an easy way to incorporate math/multiplication into cooking). They also tasted two beverages: white gourd drink and lychee drink. The snack was finished with two candy-type treats: seasame flake crisps and peanut flake crisps. The hour was done before we knew it. This easily could have been stretched out for many more lessons. However, it was a good refresher for my daughters (who are both adopted from China), and a good introduction for the other girls. the food looks so tasty. I always try to cook my german version of chinese or asian food at home. I love this kind of food.